Easter is usually a good golf day for me. I don’t really have any family obligations and it’s one of the rare holidays where the courses tend to be a little less busy. That really didn’t matter where I was headed, though, because where I played I can’t imagine the courses are ever too packed. I headed back out to the middle of the Mojave Desert again to play a few really obscure tracks. 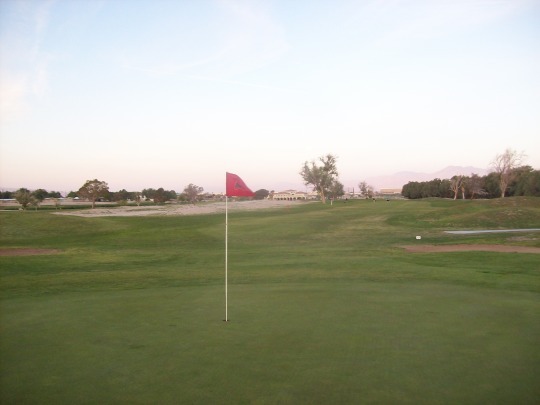 Two of them are part of military bases and the other, well, it’s probably the most obscure and unusual course in all of Southern California. I always use the acronym to shorten these military base names in my titles, but in this case “NAWS” stands for Naval Air Weapons Station. I had actually been holding off on this course for some time because I had uncertainties about getting on the base and it’s too long a drive to risk getting turned away at the gate. I called there on several occasions and always got mixed information. 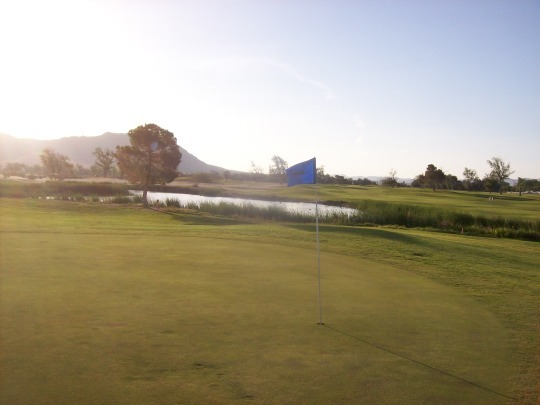 The people at the course were relatively consistent in telling me that as long as I could get on the base, I could play the course. However, how I’d get on the base wasn’t quite as clear or consistent. The safe bet was always to go on a weekday so that I could get a visitor’s day pass from the main ID office. But then again, I never really wanted to use a day off just for this trip. 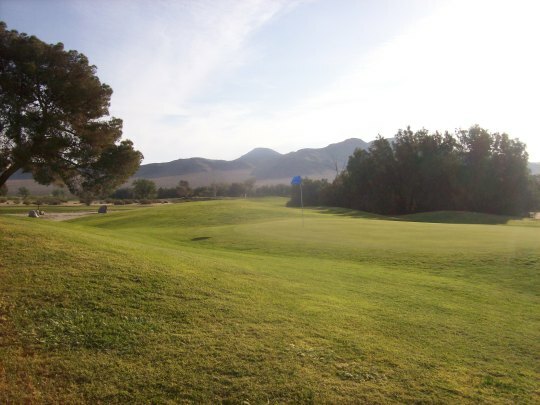 More recently, I called again and both the pass office and the golf course mentioned that I should be able to get on during a weekend through the main gate. They would still have to vet my ID and it may take up to 20 minutes, but it was supposedly a pretty common procedure. I wish I had known this sooner or I wouldn’t have put this trip off for so long, but it was still a little risk as you never know who you’ll encounter at a military base gate and if the process will go smoothly or not. I’m glad to say that it couldn’t have worked out better. The guard at the gate was very nice and told me it would be no problem. As I was handing him all my information (driver’s license, vehicle registration and auto insurance card), he let me know it would take a few minutes to process everything. However, I had an ace up my sleeve. Just in case in might help, I brought my Department of Defense ID card that Edwards Air Force Base issued me late last year after I went through their complicated process in order to play that base’s course (Muroc Lake). Since they had already done the full background check, I thought having the card might help, even though this is a Navy installation. Well, the pain of getting that ID paid off because the guard took one look at it and was convinced I was legit, so he let me on through without any further delay. I got to the golf course earlier than hoped and was teeing off a few minutes later. I caught a group before they left the first tee and they let me go ahead, essentially making me the first off on the course and having it all to myself for a sub-two-hour round! The price as a civilian was a very reasonable $41, which included the cart. As hoped, there were no issues at the course. 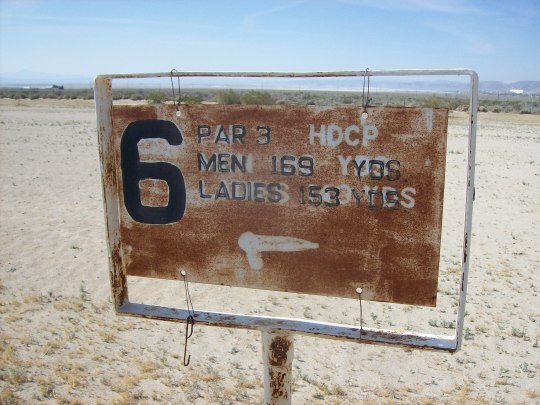 As they said, as long as you get on the base, anyone can play the course. As for the course itself, it’s pretty standard fare compared to some other military courses I’ve played in the past year. 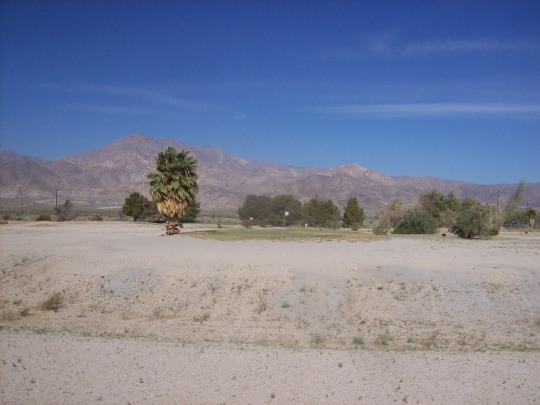 It most resembles Desert Winds out in Twentynine Palms, but also has some parts that reminded me of Furnace Creek in Death Valley, which actually isn’t too far away from China Lake. 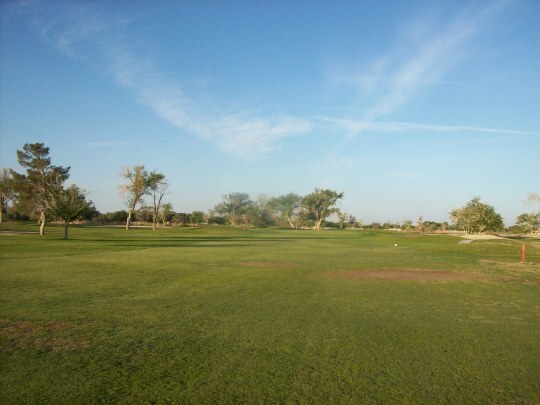 As is common with military courses, the layout is relatively long, but pretty wide open from tee to green. 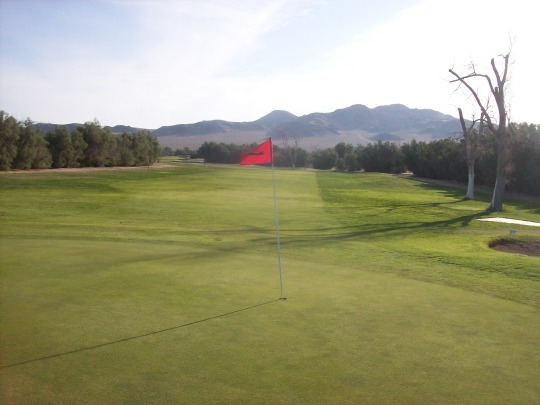 The blue tees measure out to just over 6,800 yards and the design, other than a couple of interesting holes, is right out in front of you. The 12th is easily the most interesting hole as an unusual dogleg that wraps around a lake but also has some tall trees on the corner to force some risk/reward options for long hitters. 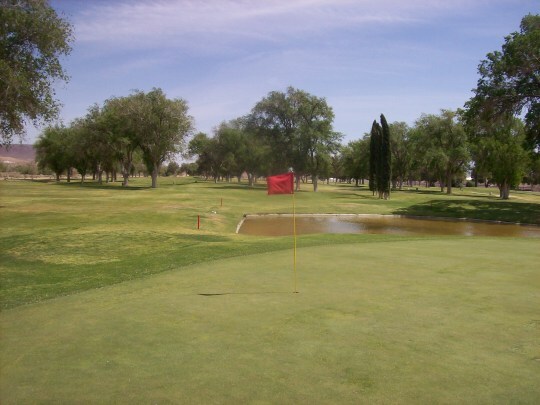 For me, I had to play it as a three-shot hole and the second shot was tough as I either had to still go around those trees and leave a long third shot or go right through them for a shorter approach. 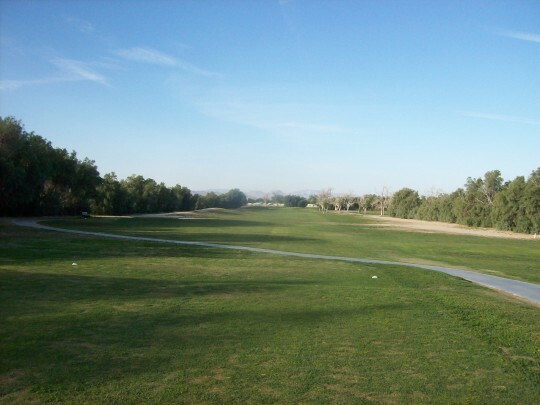 Beyond some lengthy holes, though, the layout is very forgiving from tee to green. 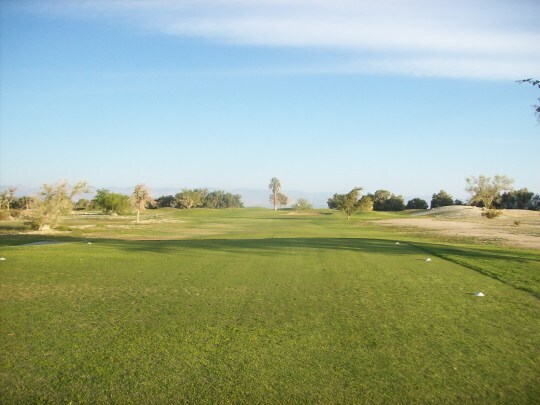 The back nine is definitely more interesting overall than the front, but neither side will blow you away. 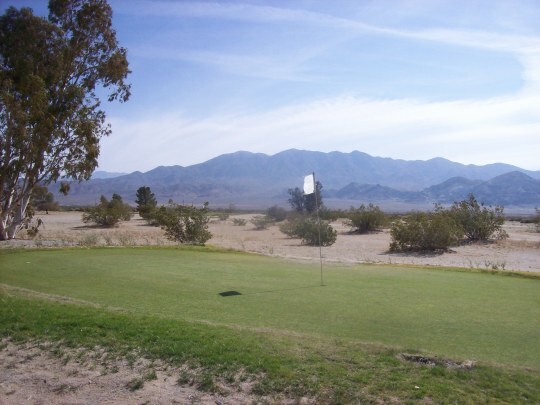 The course sits on the edge of the base behind the main housing areas, so much of it runs right along the open desert with rugged mountains framing the background. 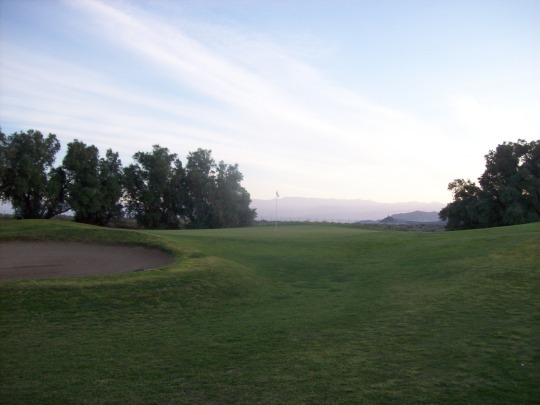 It was a nice time of day to play as the sun slowly came up over those mountains to illuminate the valley and the course. Lighting for pictures was a bit harsh early on, but I’m used to that as an avid dawn patrol player. Given the location, I would presume it’s often windy here in the afternoons, but I was surprised it was already very windy first thing in the morning. Between the winds and the firm conditions throughout the course, I was enjoying a ton of extra distance on my drives on downwind shots. Even into the wind, low drives would roll out nicely. In general, the conditions were just okay. I wouldn’t expect things to be too great this time of year because it’s still quite cold overnight in the high desert and the drought is having its effect, too. Things weren’t consistent, but overall the playability was fine. There were some nice lush/green fairway sections that showed how well the course could play and other spots that were very thin or spotty. The rough was more weeds than typical course grass, but it was decently maintained/mowed, so it was never too difficult to play from. Most of the rough here just kind of dwindles out into the native desert areas, so nothing is really “framed” that great visually. The greens were firm and rolling at medium speeds. You could tell they aerated maybe 3-4 weeks ago, but they’ve healed well and should only get better. 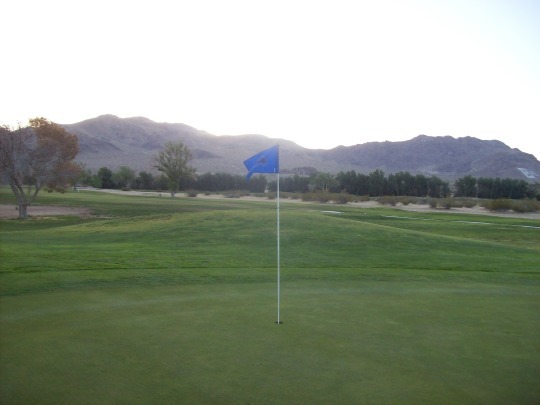 The greens at China Lake are relatively small. 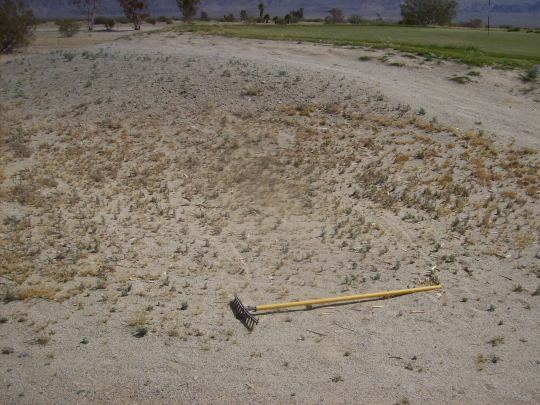 I was in a couple bunkers and they had nice sand. Is China Lake worth driving 2.5 hours out of your way for? 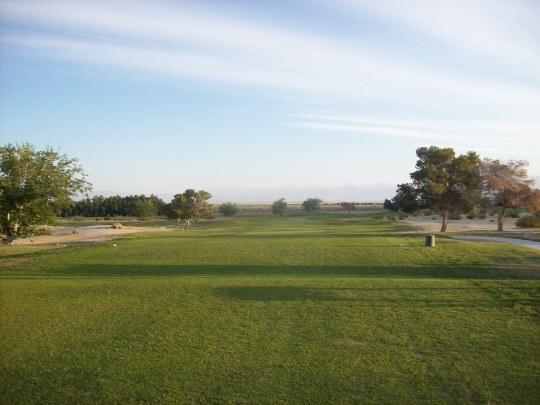 Of course not, but for the people on the base and in nearby Ridgecrest it really is the only game in town. 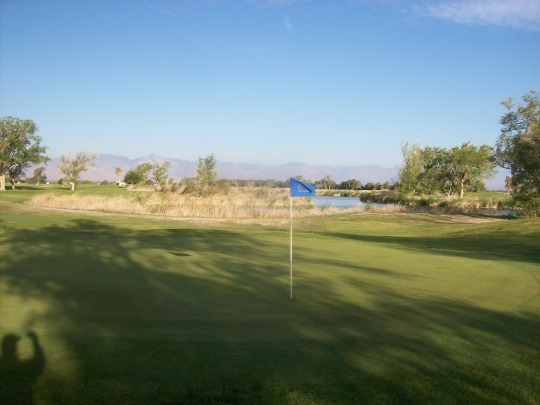 There isn’t another full-length course within an hour (maybe Tierra del Sol), so it’s a pretty solid option when no others are around. 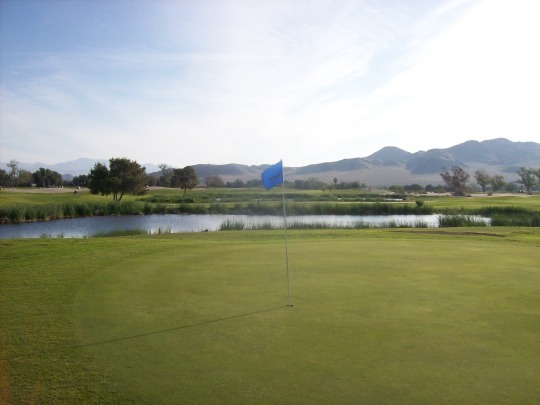 First, I should note that my definition of “Southern California” as I’ve been working my way down these lists of public courses consists of San Luis Obispo, Kern and San Bernardino Counties on down. If you ever look at a county map of California, you’ll see the top borders of these counties pretty much run as a straight line across the bottom third of the state. In this remote area spanning between Antelope Valley toward Death Valley, the county lines are all over the place. Some courses are in LA County, some are in Kern, others are in San Bernardino. And then there is Inyo County, where Death Valley is located. China Lake is in Kern County, but as you head just 20 miles northeast toward Trona, you soon enter San Bernardino County. 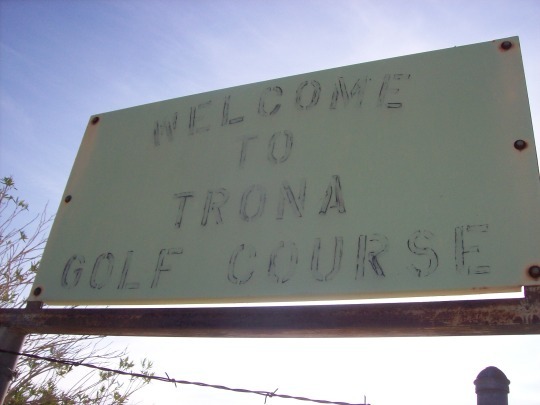 Unbeknownst to me until Sunday, on the far edge of the small town of Trona, you actually cross over into Inyo County before you get to the actual golf course. 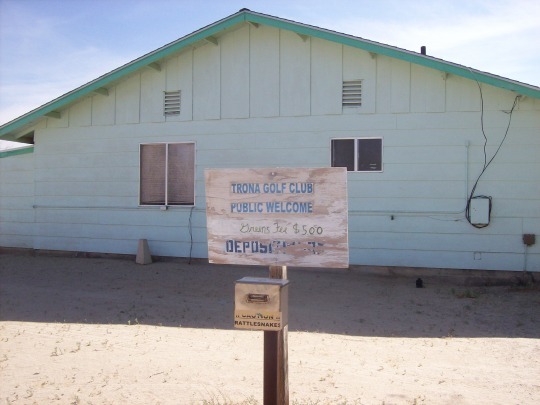 Though it’s a municipal course run by the city of Trona, it’s physically located in a different county. The town of Trona located in Searles Valley and along the edge of Searles Lake and its salt flats. With chemical plants and mining facilities being the primary industry here, it’s a place in the middle of nowhere that time seems to have forgotten and it kind of resembles a post-apocalyptic wasteland. I drove through the small “town” at made my way to the course. 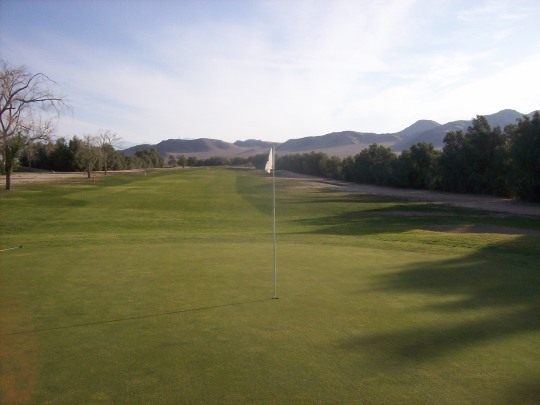 It should be noted that if you map the address that is listed in the SCGA guidebook or online in association with the course, it will show you a spot in town that is really nowhere near the actual course. In anticipation of this day trip I was ultimately taking, I had been researching this course for some time because a lot of mystery surrounds it. Not only is it in an extremely obscure location, but very little information exists about it. 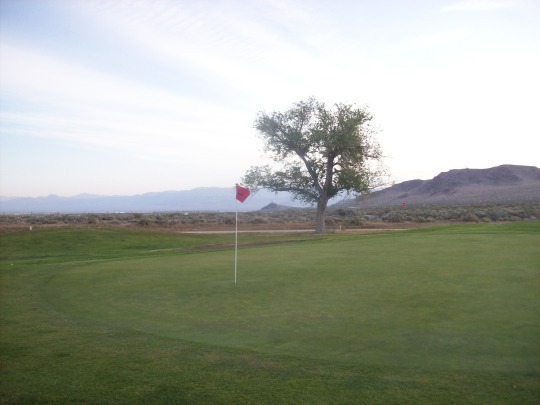 I found a few blogs that referenced it and it is listed in the SCGA course directory, but not much else. I scoured Google Maps looking for anything resembling a course in this town and had a heck of a time finding it. Luckily a friend was helping me look and just last week he finally found the course on the map. It was north of the main town in an area I hadn’t really be searching. 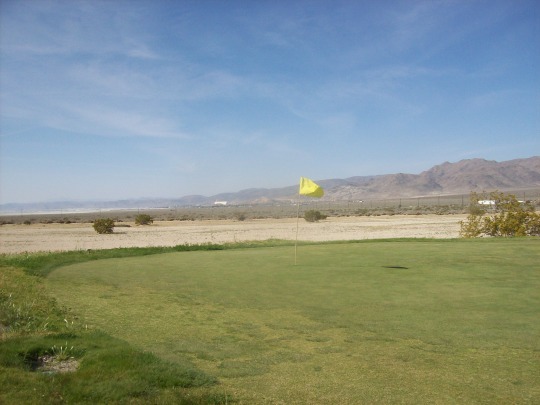 So, if you are considering playing Trona Golf Course, know that it is just north of town and past the little airport. 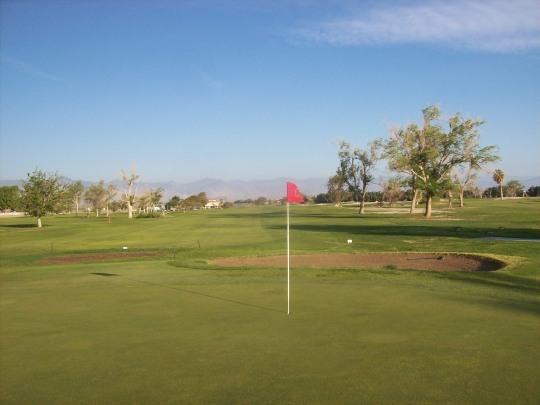 The next road is called Valley Wells Road and will take you right to the course. There is a sign on the main highway, as well, so you can’t miss it as long as you go far enough past the town. 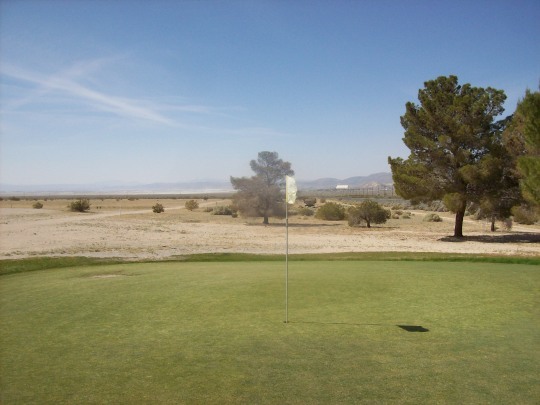 Between these directions and the photos, this will easily be the most detailed review of Trona Golf Course you’ll find anywhere online (at least at the point of this posting). As for the course, it is a true adventure. 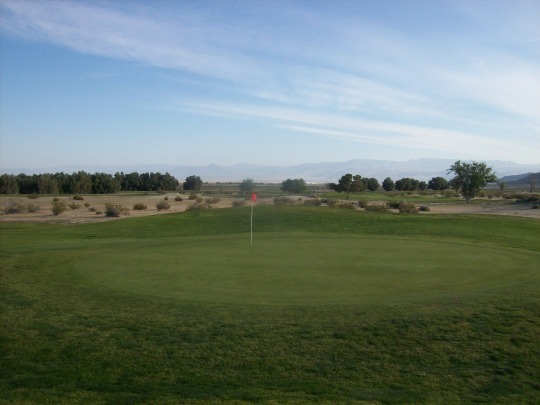 It is an oddity that offers some appeal for pure curiosity value, but at the same time it probably barely qualifies as a golf course. As expected, there is just a box out front to drop in your money ($5). There is a small building there and I couldn’t quite tell if it’s some sort of pro shop/clubhouse or actually just where the person lives who maintains the course. After that, it’s pretty much just you and the desert. 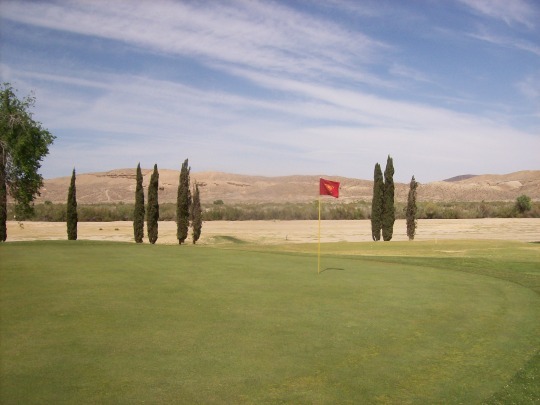 Trona is a 9-hole course and there are no such things as “fairways” here—at least not in the traditional sense. The tee boxes are primarily just beat up old mats, though there are a couple that have a little grassy mound you can hit from. Then, there are actual grass greens with a little bit of rough surrounding them. That rough is still pretty spotty, but it is some grass. 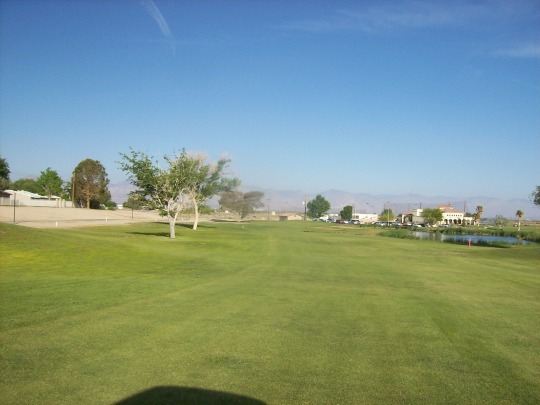 Between the tees and greens, it is nothing but open desert sand and brush. In other words, if you are protective of your clubs, this is the course you want to bring your old back-up set. 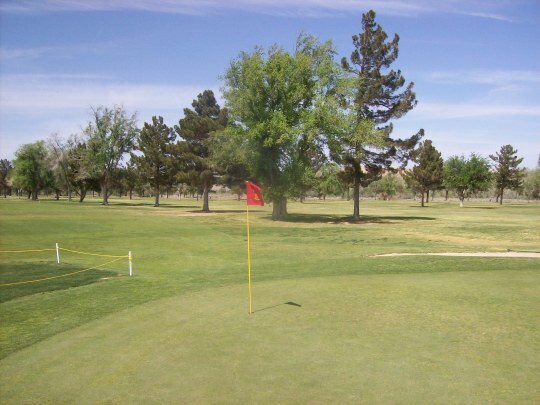 There are some posts lining the “fairways” to denote where the holes are going and the middle areas are free of any bushes, so if you look hard enough there is some shaping to the course. 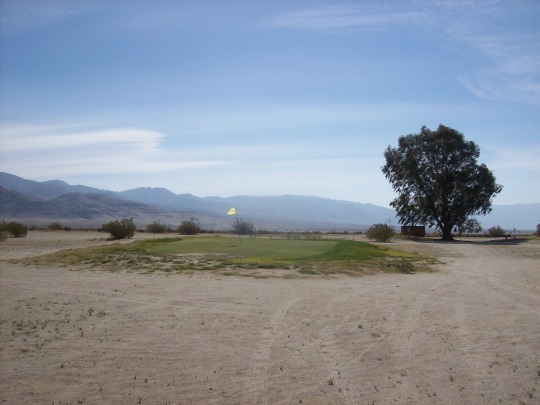 Now, you might think that a course with this kind of set-up would just be a little pitch and putt track where you don’t need to use many clubs and the desert wouldn’t come as much into play. Well, you’d be wrong. 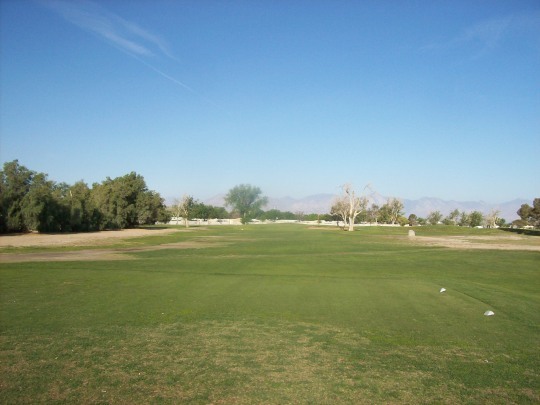 This is a regulation-length 9-hole course that plays to a par of 36 and is over 3,500 yards. It even has two different sets of tees (several with very different angles) so you can play it as a full 18. Needless to say, it’s a trip. 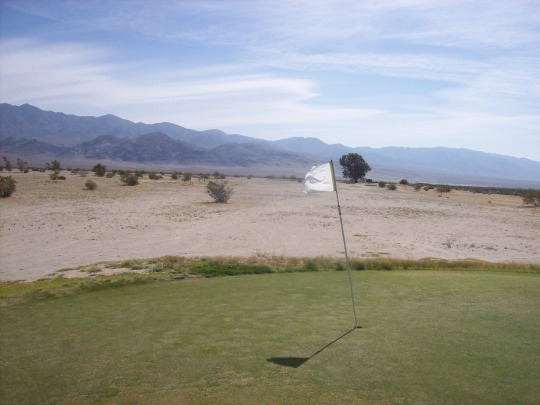 And, it’s a tough freaking course when every shot is basically played from a desert waste area. The greens are tiny and firm, so they would be hard to hold even if you were hitting from normal grass lies. When you’re hitting from crusty sand that is sometimes kind of soft on the top layer and sometimes hard as a rock, good luck! 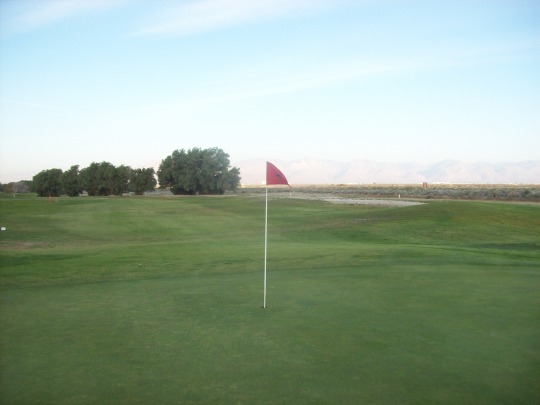 Note: I learned well after I played Trona that there are some portable mats located by the little clubhouse that you are allowed to “borrow” for your round if you don’t want to play off the bare dirt fairways/rough. I was surprised to see a couple other players out there. They were in a cart and actually drove up to say “hi” at one point as I was walking. They were two very nice older gentlemen who are obviously the regulars here and I would guess at least one of them is the caretaker of the course. They seemed happy to have a visitor and even seemed pleasantly surprised when I mentioned I had actually put my $5 in the box. For whatever regular local players this course has, I’m sure the funky layout and terrible lies just become second nature. But I could tell they understand the uniqueness (and, let’s face it, silliness) of this course that draws curiosity-seeking golfers who want to have a fun story to tell. Again, there’s not much in the way of golf nearby. 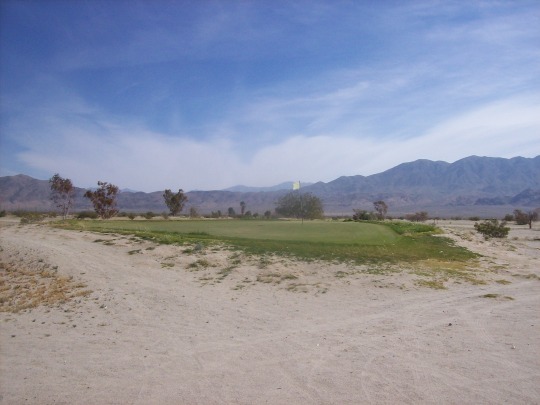 China Lake is a half-hour away and Furnace Creek is well into Death Valley, and neither are terribly convenient options compared the course near this small town—however impractical it is. As for conditions, the tee mats are pretty beat up. I will say the greens were pretty reasonable and better than expected, but far from great. And the little bit of rough grass around them is pretty hit or miss. Good lies are a rarity. So, as an oddity that offered some little bit of adventure driving out to desolate Trona and finding this obscure little course, I have to say I had fun finally checking this one off the list. I was able to enjoy it for what it is. 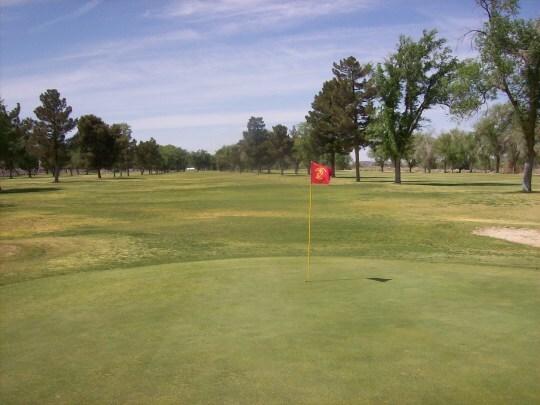 Also, I should mention that the winds were blowing like crazy (20-30 mph I would guess) and that added a whole other level of insanity to my round. It truly is the most unusual course I’ve played, but it is sure not something I’d want to play regularly. It turned out to be everything I expected it to be, which like I said, is kind of good and bad at the same time. Here is the view from the first tee, just to give an idea what you are in for. The first green is way out there, hiding just to the right of that old silo. 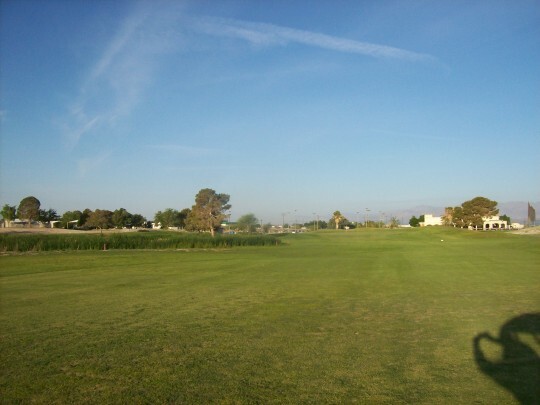 Note: This course has since changed its name to Marine Memorial Golf Course. Kind of strange since there is already a course by the same name down at Camp Pendleton. If you are looking for that review, click here. Yet another military course. In this case, the initials stand for Marine Corps Logistics Base. 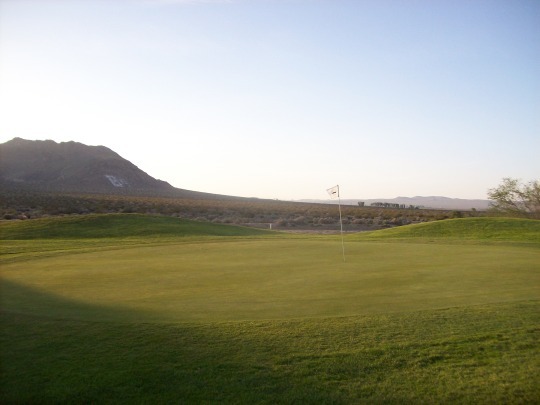 It’s just a little east of where the I-40 connects with the I-15 and is home to another course that was a bit mysterious to me. This one is easy to find on the map. It’s clear to see it on any satellite view when you look at the base, but the tricky part is figuring out how to get to the actual course. I read somewhere that it’s technically outside the gates and fully open to the public, but it looks very isolated on the other side of some train tracks. Fortunately, once you get off the freeway and head toward the base gate, there’s a sign that says where to turn for the course. Then you go down some ugly dirt roads and through a hidden tunnel (just a big drainage pipe) to go under the train tracks. It’s not terribly convenient, but it is ultimately easy to find. The place wasn’t busy it all on Easter afternoon. 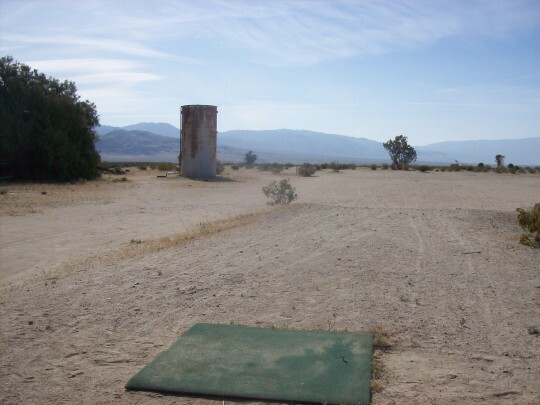 I saw a few guys out on the range and the course itself looked wide open. 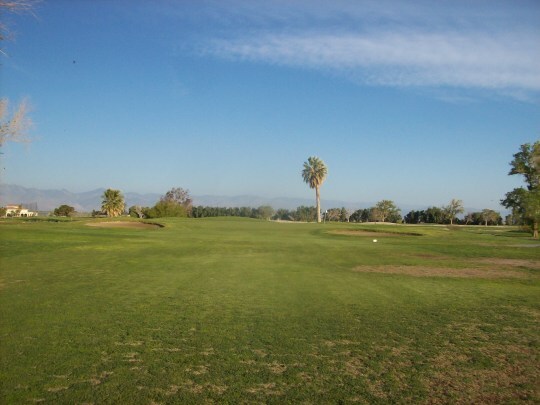 I checked right in, paid my $19 civilian rate (9 holes with a cart) and was on my way. 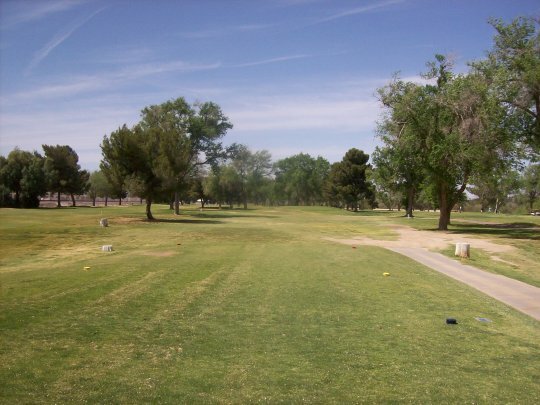 I played through one couple after a few holes and otherwise zipped around at my own pace. 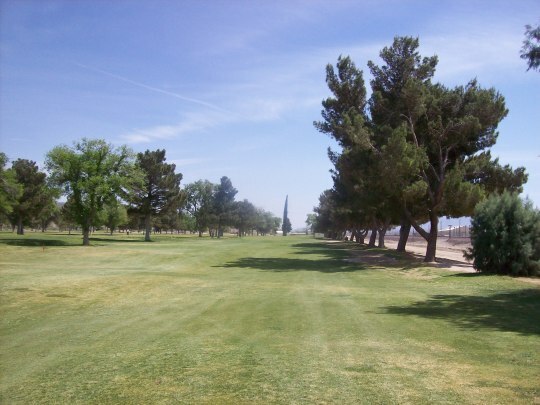 Tees & Trees is also a 9-hole regulation-length course with separate front and back nine tee boxes. It’s a traditional par-36 with two par-3s and two-par-5s. From the front nine white tees, it plays at 3,223 yards. Beyond that, there isn’t a ton to note about the layout of Tees & Trees. It’s a pretty simple course. As the name would suggest, it is pretty well lined with trees to frame each hole. 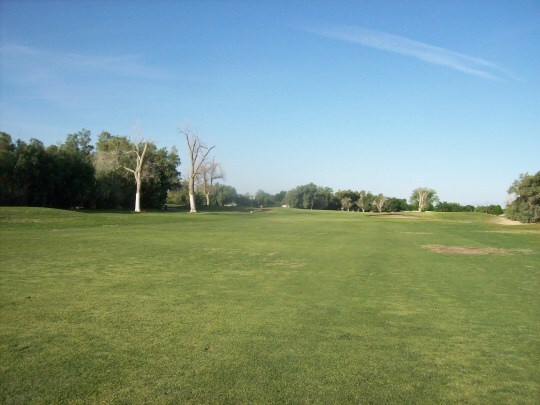 There are some minor undulations on a few holes, but mostly it’s pretty flat. It’s not a bad course by any means. 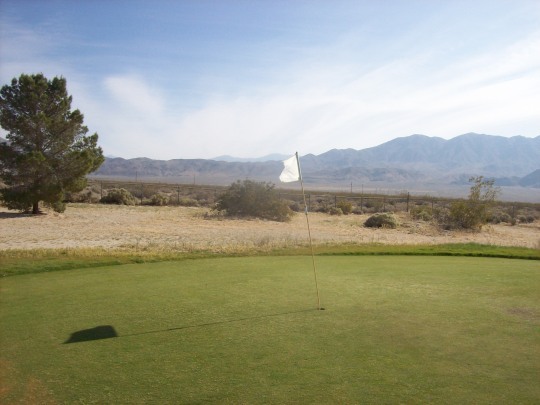 Just a pretty basic design that satisfies the need to hit the ball around for those on base and in Barstow, where it’s surprisingly the only course in town. 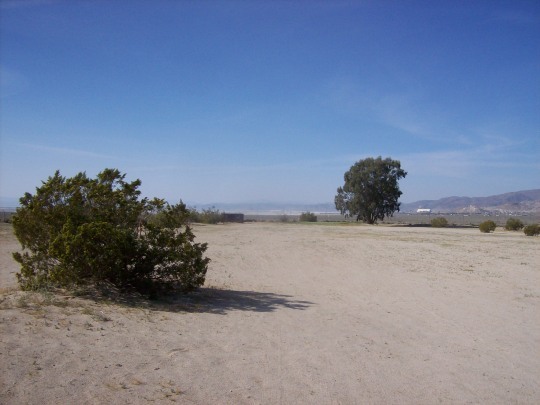 There are some down toward Victorville, of course, which would be the other nearest options. Of the three courses I played Sunday, this was by far in the best shape. It was relatively lush and green throughout most of the course. There seemed to be a mix of grasses throughout the fairways and rough, but it was all cut down consistently and generally nice to play from. The greens were receptive and rolling smooth. There are some pretty severe slopes from back to front on several of them, so it definitely pays to be below the hole. Still, they aren’t very fast, so nothing is ever that diabolical. 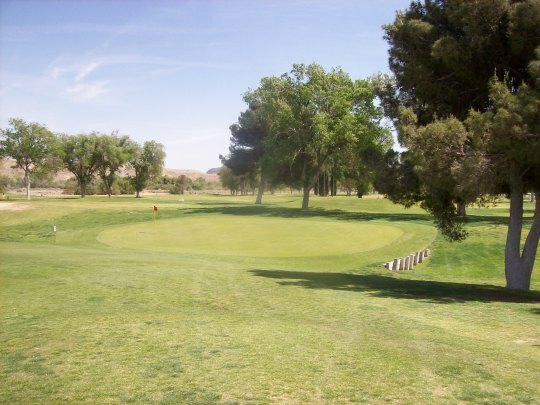 Tees & Trees is not a bad option to break up your drive with a quick nine on your way to or from Vegas. However, as a friend of mine pointed out, you are usually too anxious on the drive out to Vegas to want to stop. And, you are usually too exhausted on the way home!